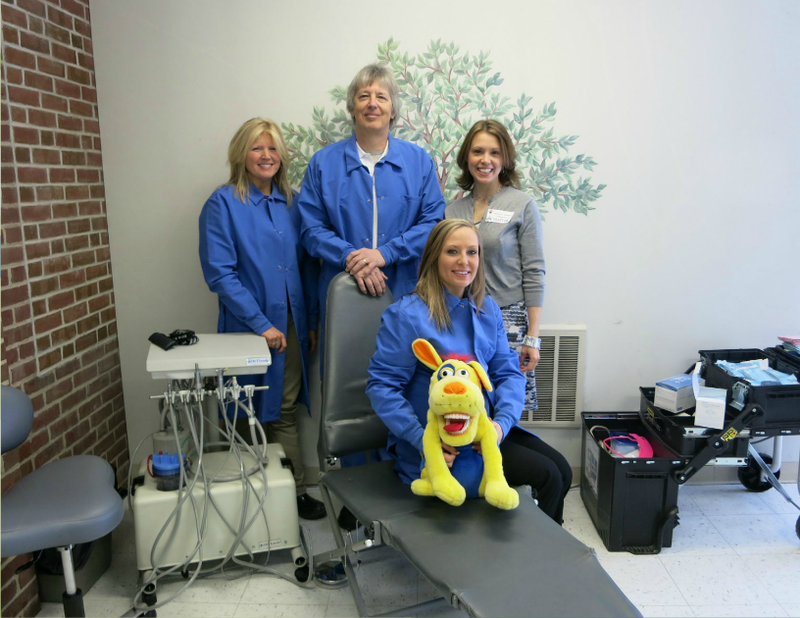 The North Country Health Consortium's mobile dental clinic, the Molar Express, uses state-of-the-art portable dental equipment to set up a professional and safe dental clinic in schools, nursing homes, and other community locations. The Molar Express is one of the network's many programs. To lead innovative collaboration to improve the health status of the region. The North Country Health Consortium (NCHC) is a rural health network, created in 1997, as a vehicle for addressing common issues through collaboration among health and human service providers serving Northern New Hampshire. Nancy Frank, executive director of the North Country Health Consortium, was interviewed by NCHN’s director of member services to share information on the network’s characteristics, key learnings, accomplishments, and challenges. A: I would describe our network as a broad-based, rural network of health and human service providers. It’s a very inclusive network that’s been around for quite some time. We do a lot of different things in different program areas. It’s comprehensive. We have a broad range of members. I feel in order to understand this network, you need to know that we do so many different things and touch in the arenas of public health, emergency preparedness, health and wellness, and AHEC services, including a summer camp for middle-school-age kids and a large substance abuse prevention program. One of the things with a network like this, with so many members, is we can continue to expand our service areas. Unlike hospital-only networks, we can take advantage of opportunities that aren’t just specific to a given area. It’s a necessity because we are so rural and the only one like this in this part of the state. We are well positioned to keep growing. The community values what we do, and we’ve been able to build on our successes to secure additional funding. A: They would tell you they benefit from being part of an organization that finds people together at a table that might not otherwise be at the same table. It allows them to build relationships and work with others for a common cause. Members are able to look at rural health needs and come together to work on them. They benefit by looking at how to solve problems together, particularly in ways they couldn’t do alone. They also benefit from education and advocacy we provide. The real value added is the ability to take on new opportunities and initiatives that individually couldn’t be done. I’m always amazed when we receive calls from around the state and New England because we are seen as a rural resource. It’s a positive result of the work we are doing in the region and around the state. We are now well positioned to launch innovative initiatives we weren’t able to before. Q: What are the advantages and disadvantages of working in your unique rural area? As for the downsides, we have a poor, less educated population that is aging quickly. We do not have any public transportation, which makes it hard to get around, especially in the winter. Access to health care is an issue. Tertiary care centers are often a two- to three-hour drive away. It’s hard to recruit clinicians, because the area is isolating and offers limited opportunities for clinicians and their families. We are very challenged finding the workforce for behavioral health services. Additionally, some areas do not have cell service or decent internet connections. I think we have a strong network that is committed to working together in innovative ways no matter what the challenges may be. One advantage we have and try to utilize is the beautiful area we live in and the many opportunities that encourage healthy lifestyles. Q: What has been easiest and most difficult for you as a network leader? A: Coming into the position, I was challenged by a real desire to change the culture of the organization, because I believe that people need to feel empowered and feel they have control over what they’re doing. They need to be supported. Internally the challenge was shifting staff around in order to utilize people’s strongest skills and ensure that the right person was in the right position. The easiest was coming to this organization where there were really good staff committed to the work of the Consortium. Also, I came in with relationships with some of the board members from my prior work with the network, which helped build trust and establish a strong collaborative environment. A: I think this work is all about relationships and trust and finding common ground. It’s about moving forward around common needs and goals. You can’t do work without those relationships established. For example, New Hampshire was awarded an 1115 Medicaid waiver to integrate mental health, substance abuse and primary care. The state is asking us to work with another region of the state. In order to be effective, we have to establish and nurture new relationships and trust before we can begin the hard work together.